Love the feel, fits the bed perfectly, machine washable is a plus. Breathe new life into your bedroom decor with the Traditions by Waverly Maldives 3-Piece Quilt Collection. This beautiful ensemble features an updated floral pattern in rich blues and greens on an ivory ground. Scalloped edges on the quilt and shams add charm and style. Set includes one quilt and two coordinating pillow shams. Machine washable. Wash in cold water on the gentle cycle and tumble dry on low for long lasting beauty. Pillows are spot clean only. 100-percent Polyester. I love this quilt! The various shades of blue match my decor perfectly. The colors are true to the picture and the quilt is well made. Being that it is a quilt, it is shorter than a comforter, so you will need to use a bed skirt or or have a larger blanket in a complementary color. It does not go to anywhere near the floor as shown in the picture. 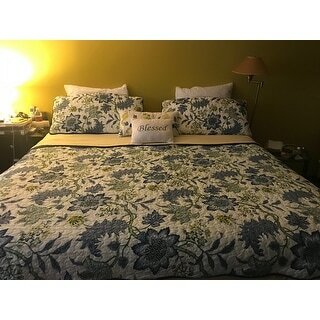 I plan to get a thin navy quilted bedspread (which is considerably larger and put this quilt on top, If you have a queen sized bed, I'd definitely get the king size. I purchased a king size for my queen sized bed. Colors are more navy and shades of blue than grayish blue as shown in the picture. The quilt is very warm and beautiful. The colors are pretty and the quality is good, but I was looking for something that hung down as far as it does in the picture. We have a King bed, and the king size quilt barely has enough length to cover the mattress, it doesn't even extend as far down as the box spring. This Waverly quilt and sham set has beautiful colors. Rich blues, a touch of grey and green. Will go with a variety of decors. I ordered for a guest room. Scalloped edges add a very expensive looking touch. Overstock ordering is very easy. This quilt set was delivered quickly and was in good packaging. I ordered this for my master bedroom for the summer time. My bed is a queen, and the queen comforter is made to fit a queen/full. It is much, much shorter on the queen bed in person. The coloring in the picture looks like more of a slate gray/blue with soft greens and yellows but in person the blue is more navy with highlighter yellow hues. I ended up keeping it but will probably use it as a coverlet for decoration more than I will use it as an actual comforter. It's definitely more of a country farm house look than it appears in the picture. As far as quality, it's great quality! It just wasn't the look I thought it would be. I would reccomend but wish the picture provided was more accurate. I ordered this in a king size for my queen size bed because one reviewer said it was not long enough on the sides. I am glad I did. I needed the extra length because I don't have a bed skirt around the bed.. I love the colors. It comes with two pillow shams. I had to cut those down to fit a regular size pillow. All is good and I am very happy with this purchase. This quilt set is beautiful! The quality is excellent and colors stayed bright even after washing. I purchased a queen for queen sized bed (I had read recommendations to buy king but king size was not available). The size is perfect! The duvet set was just as pictured. The colors are muted blue and green The quilt, itself, is a perfect size for a queen platform bed. The only drawback is I wish the shams were larger than standard size. King size pillows would have filled out the shams and completed the look. This is a beautiful quilt set. Quilt is medium weight which works great since I use a down comforter on the bed also. It is beautiful in my spare bedroom with my antique bedroom set. Was able find floral curtains to match. This quilt really adds some color to the room and still has a vintage feel which is exactly what I wanted. I love this quilt set. It is beautiful. I love this pattern but was disappointed in the size. I wish it was wider. Its very short on the sides. The length is fine. This comforter set is bright, crisp and clean looking just what I was looking for on these cold gloomy mornings. The print is lovely with a little yellow to accent the navy blue. 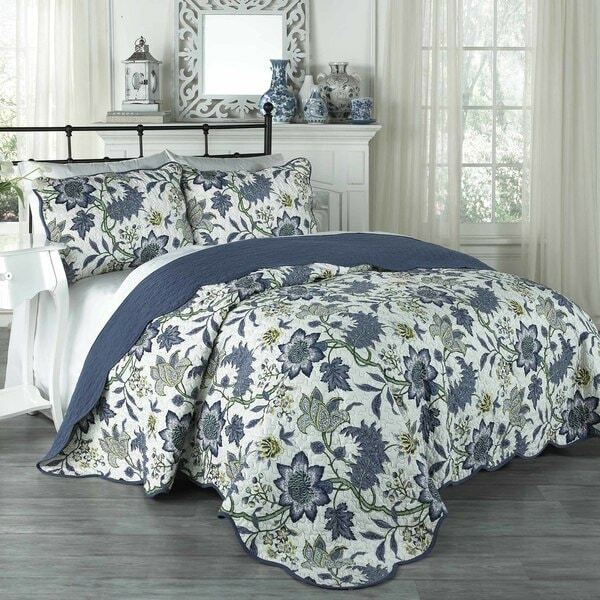 For me this comforter set is perfect. Beautiful vibrant color and quite soft. Bought two, one for me and another for my sister. Quilt arrived quickly, in nice packaging! A little thinner than I like, but thankfully it is not stiff like some thin ones tend to be. It is soft &amp; cozy! Thought it had more gray in it, but colors are still nice. Beautiful colors. Lightweight quilt. Looks great, soft and inviting. Truly makes the bedroom look updated. Love this Quilt. Only complaint is that I had to order a king size for a queen size bed. Waverly needs to make them a little wider. Will be short if I chose to use on my king size. Beautiful colors and fabric. 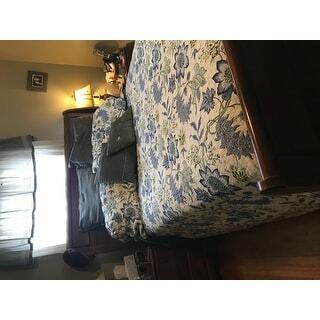 I really like this quilt, but the image shows it hitting the floor and we have a king sized bed, and the kind sized quilt doesn't come close to hitting the floor... I'm guessing the image is a queen bed w/a king quilt... as pretty as it is, I wouldn't recommend for a king bed. I purchased the Waverly Maldives quilt set for the Spring and Summer seasons and it looks fantastic! It is a light-weight quilt — just right for a cool spring night. Be aware that the photo and description do not show that there is some yellow in the design. It still worked out great for me. I love this 3 pc. guilt set It is just as it looks in the photo It really cheered me up when it arrived I have a queen size bed so I ordered King so it fits to the bottom on the sides and the quality is excellent. Bought this and love it. It’s a little lighter weight than I thought but it’s definitely a keeper. It fits my king sized bed and as others have stated it is not as long as the picture indicates. It is even on both sides with my box spring mattress. I already had a navy bed skirt on the bed so it looks great! Background is not a crisp white but ivory. Priced so low l will keep it rather than return. The colors are very close to what is pictured and if other reviews hadn't said that the quilt was not cotton, I would have never noticed. Very light and breathable. This will be perfect for our guest room. I put this set on my bed right away. It is beautiful and the colors are lively and it light weight for spring and summer. The sheets above go great with it, too. Beautiful mid weight quilt. The colors are exactly as shown. Very pleased. "Does a queen size hang over the side quite nicely or should I order a king? We have a tall bed." Order a king ...that size wasn’t available when I got mine .if it was I would have ordered the king size one ! "Is gray among the colors of blue and green?" "Does it have a valance to match"
The Waverly Maldives Quilt Collection does not have a matching valance. "waiting for king size - when will they be back in stock???" "Is there some matching curtain to go with it or valance"
I am not aware of any curtains or valances that go with this set. "If I order and it doesn't fit my king mattress.....can I return at no cost?" Yes you can return it at no cost, if it doesn't fit. But you might need to call the customer service to get it returned for no cost if it does not give that option on online return form. The size is pretty good, it fits very well with the King mattress and hangs on the sides as well. "Can someone who purchased this post a picture of the actual item? From the reviews saying the actual colors are much different from the overstock photo I’d really like to see from a picture"
I think the photo represents the colors great. I am very happy with it.